The classic account of the uncanny valley was written by a Japanese researcher, Masahiro Mori, who was working on robots. He found that the more a robot resembled a human, the more people liked it, up to a point. At that point, people started viewing the robot as unsettling and scary. Beyond that point, people started viewing the robot positively again. The images in the banner above show the principle. R2D2 and C3PO are both human-like in their different ways, but are very clearly robots; they are both much-loved figures. The fourth image shows Roy, one of the replicants from Blade Runner; in the film, the replicants are artificially created beings, so similar to humans that sophisticated tests are needed to tell the difference. They are on the far side of the uncanny valley, easily able to pass normal inspection as very attractive, highly talented humans. The third image is a very different proposition. It’s a robot, intended to look like a human. It comes across as creepy and unpleasant. The overall effect is like climbing up a sunny hillside, and suddenly encountering a deep, dark gorge; once you get past the gorge, the rest of the hill is sunny and attractive. The question that intrigued Mori and subsequent researchers was why that valley suddenly appeared at that point. There’s a good account of different explanations in the Wikipedia article about the uncanny valley. The explanation that Mori favoured, and that I think is the correct one, is that the uncanny valley occurs when it’s not clear whether something is human or not. The unease comes from the uncertainty. That explanation fits neatly with various other phenomena. One is the way that humour and shock relate to each other, which can be neatly explained in terms of the match between initial impression and subsequent evidence. If the initial impression is that something is dangerous, and then it turns out to be non-threatening, the result is humour and relief. Conversely, if something initially looks safe, and then turns out to be dangerous, the result is horror and shock. The bigger the gap between the first impression and the subsequent realisation, the stronger the emotional response. I’ve blogged about this in more depth here. This makes sense of why uncertainty about categorisation is scary in some contexts, but not scary in others. Segways, for instance, don’t fit neatly into the usual categories for transport devices, but they don’t evoke feelings of unease and fear. More positively, a lot of aesthetic effects are based on non-threatening ambiguities; I’ve blogged about that previously here. Another phenomenon that relates to the uncanny valley is Capgras Syndrome. This syndrome has resonances with at least one classic horror movie. In Capgras syndrome, a person is convinced that someone close to them has been replaced by an impostor. It’s as distressing and unsettling as you might expect. Sufferers often put a lot of effort into making sense of the situation, sometimes producing elaborate explanations for what might be going on. The neurophysiological explanation is fairly simple. What’s happening is that the patient’s emotional associations about the person are stored in one set of neural pathways, but their non-emotional knowledge about that person is stored in a different set of neural pathways. If the linkage between the emotional associations and the non-emotional knowledge is lost through illness or injury, then the patient will recognise the person’s face, but feel none of the emotions that they expect. The patient’s cognitive system now has to make sense of why someone looks like, for instance, the patient’s mother, but why the patient doesn’t feel anything emotionally for that person. One possible explanation is that this isn’t actually the patient’s mother, but someone who looks like her. It’s initially plausible; we all have experiences of seeing someone who happens to look like someone else that we know. However, this explanation then raises all sorts of questions about why someone else would be saying that they actually are the patient’s mother, which takes the patient rapidly into the wilder shores of conspiracy theories and horror stories. This article has been about strong, often disturbing, emotions, and about explanations for those emotions. It’s tempting to assume that causes mirror consequences; that a major event must have a cause of equally epic proportions. The reality, however, is often different. Major events and phenomena often arise from causes that are simple, or petty, or minor accidents of fate. One of the fascinating themes in a wide range of research has been the abandonment of early, complex explanations in favour of cleaner, simpler explanations which in turn produce unexpected and powerful new insights. I’ll close with an image that arose from one of those new explanations. 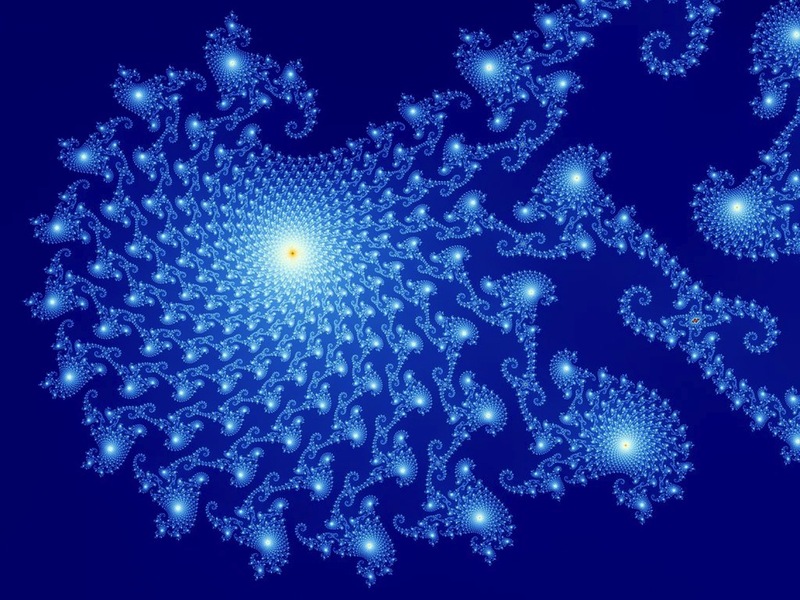 It’s a fractal; it’s produced by the outputs from an apparently simple equation. Those outputs turn out to have complexities and regularities and beauty that most people would never have expected. In a future article, I’ll look at some of the underlying regularities in what people believe about the world. This entry was posted in aesthetics, art, categorisation, error, mathematics of desire, rationalisation and tagged capgras syndrome, complexity, simple explanations, uncanny valley by hydeandrugg. Bookmark the permalink.